Headlines: 1996 was known for the introduction of Hotmail, the free email service and the very popular Motorola StarTAC flip cell phone. Garth Brooks won the 23rd American Music Awards, a new $100 bill was released in the USA. And, gas prices were at their highest level in five years. 1996 was also the year that production started on the all-new 1997 F-150 but only in limited numbers at first as an early model. 1996 marked the last year for this generation of F-150. 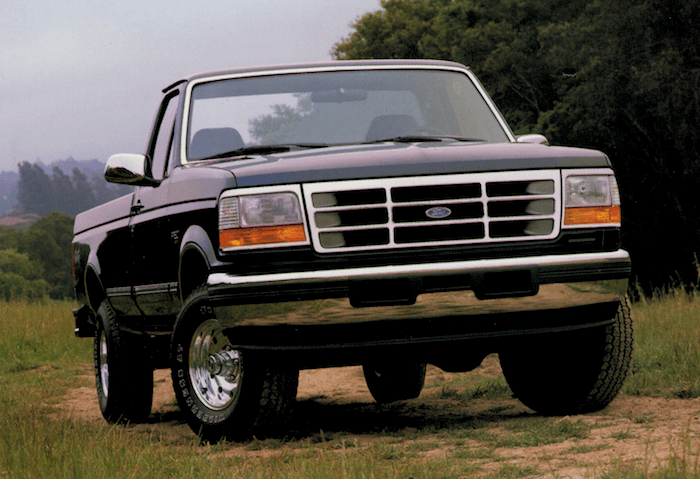 The body style would stick around for the 1997 model year for the F-250 and F-350, but this was it for the F-150 body. 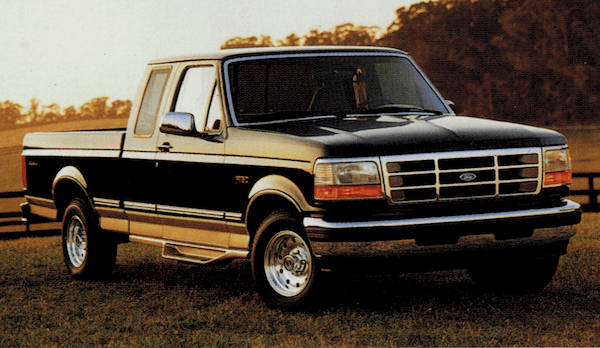 Some say 1996 was the last year for a real truck-like F150 as the 97 model is much more car-like. Ford sold nearly 800,000 F-Series trucks in 1996. Here's a video tour of a low mileage 1996 F-150 XLT. What a beautiful truck. I encourage you to take a few minutes right now to check this truck out! There are not a ton of changes to mention for 1996 as the all-new 97 was starting production and getting headlines. The high end Eddie Bauer trim level was an option again, although it was dropped after 1996. A couple decades later, there would be hints of the Eddie Bauer version in other high end F-150 versions such as the Limited, Platinum and King Ranch editions. The SVT Lightning F-150 model was dropped for 96. Also, the Flareside box was no longer an option. Ford began changing seats to have integrated headrests. For '96 you could buy a Special, XL, XLT or Eddie Bauer trim level. You could still get regular cab, Super Cab, and Flareside configurations. 1996 saw the last year for the "bulletproof" inline 6 4.9L engine. The 5.0L V8 was only available in the F-150, not the F-250 or above. 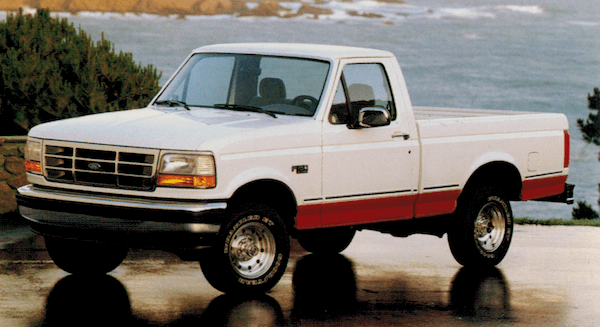 And, the 7.3L Power Stroke V8 diesel engine that was introduced in 1995 stuck around. The 4.9L I-6 had 145 horsepower and 265 lb-ft torque in 5-speed manual with 2.73 or 3.08 axle ration trucks, or models under 8,500 lbs GVWR with 4-speed automatic trans. Other configurations made 150 horsepower and 260 lb-ft of torque. The 5.0L V8 made 205 hp / 275 lb-ft torque with manual transmission, or 195 hp / 270 lb-ft of torque with an automatic transmission. The 5.8L V8 made 205 hp / 325 lb-ft torque with in 49 states, and 210 hp / 330 lb-ft torque in California. There were two two-tone paint options, one is Deluxe Two-Tone and the other is Lower Accent Two-Tone.